Some of Leeds’ top manufacturers have joined forces to celebrate the very best of their industry and mark the start of the month-long Leeds Manufacturing Festival. Brandon Medical, Daletech, Hopkins Catering, MPM and Sound Leisure have come together to showcase the role manufacturing plays in the local economy, raise awareness of the wide range of manufacturing companies in Leeds and help manufacturers attract the next generation of young people into the industry. Victoria Hopkins from Hopkins Catering in Pudsey, who is one of the key people behind the initiative, said: “Leeds Manufacturing Festival will allow anyone interested in manufacturing to see for themselves what it is like day to day working in the sector and find out more about the exciting career opportunities that exist in manufacturing in Leeds with businesses of all sizes taking part. Mike Rimmer, operations director at Morley-based Brandon Medical, an award-winning medical technology company, added: “I am really proud that we are taking part in the Festival as this industry needs young people to pick up the next state of the art developments in manufacturing techniques. “We’re all set to open our doors to schools and young people in a bid to get the message out there that manufacturing has changed. It is a very clean, tidy, tech driven industry and we are crying out for young people to come and start their careers with us. “I started out my working life as an apprentice and really understand the value that such an opportunity brings. People can try out working in all areas of the business from manufacturing to finance and get a great grounding to help them progress their careers. 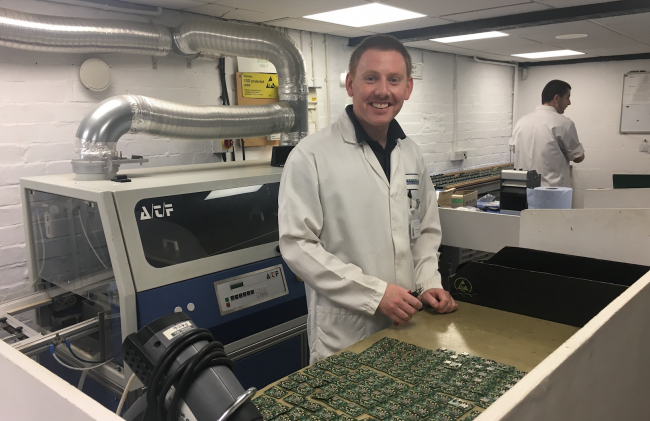 Tracey Dawson, MD at Daletech – a niche manufacturing firm specialising in low volume, high quality electronics based in Pudsey, is also involved and backing calls for more to be done to encourage young people to get into the region’s sector. Tracey concluded: “We all need to do more to develop ‘fresh talent’ and ensure the manufacturing industry’s sustainability through initiatives such as apprenticeships which are a really good way of getting young people in. We want people who can grow with the business, who we can upskill. It’s about attitude – if they’ve got that, we can teach everything else. MPM, a manufacturer of high-quality fibreglass based in Bramley and Sound Leisure, which has 100 staff who manufacture and distribute jukeboxes and coin-op equipment across the globe from their site on Sandleas Way, are also heavily involved. To find out more about the Leeds Manufacturing Festival or to sign up and get involved visit leedsmanufacturingfestival.co.uk.